StateWays | www.stateways.com | January/February 2017 7 sions about warehouse management systems, and people still didn't under- stand it's all about data," Meier said. "Our workfl ow management solution doesn't just run our warehouse, it pro- vides data and analytics." Other sessions throughout the day included "Servicing National Ac- counts," "Alcohol's Impact on the Ad- olescent Brain," "The Public Health Impact of Deregulation" and "Good Business Ethics," among others. 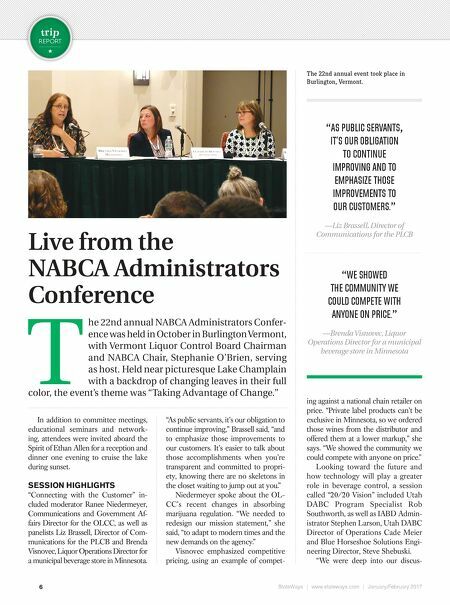 The day concluded with a fond farewell to outgoing Ohio Division of Liquor Control Superintendent Bruce Stevenson, who was also a longtime NABCA Director. The fi nal session of the conference featured a lively discussion of a hot topic, called "Marijuana: What's Next?" Keven Sabet, the director of Smart Approaches to Marijuana, shared his concerns that the legal marijuana push in many states is being fi nanced and driven by hedge funds, which don't have the public's interest at heart. "The movement no longer rep- resents counter-culture like it did in the 60's and 70's," he said. "The mari- juana grown today is nothing like what previous generations experienced." "The drug dealers I'm most wor- ried about are private equity manag- ers who look up to Phillip Morris," he concluded. • "THE MOVEMENT NO LONGER REPRESENTS COUNTER-CULTURE LIKE IT DID IN THE 60'S AND 70'S." 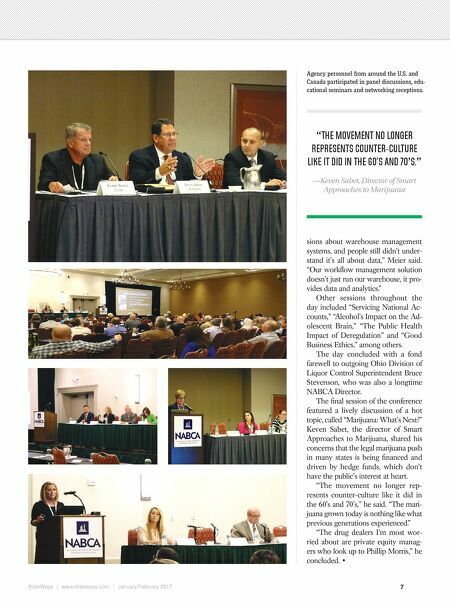 —Keven Sabet, Director of Smart Approaches to Marijuana Agency personnel from around the U.S. and Canada participated in panel discussions, edu- cational seminars and networking receptions.